Layers of the Earth's atmosphere with corresponding temperature profiles. Earth?satmosphere was known to "breathe" in a cycle lasting nearly a month.Now scientists say the planet takes a quick breath every few days. Thebreathing-like activity is the result of high-speed solar wind disturbances thatcause a recurrent expansion and contraction of Earth?s atmosphereevery few days, satellite observations show. This atmospheric mode could affectradio communication, orbiting satellites and possibly the Earth'sclimate, researchers say. Theexpansion and contraction happens way up in the Earth's thermosphere, the layerof the atmosphere that extends from about 60 to 300 miles (96.5 to 483kilometers) above the planet's surface. The thermosphere is constantlyinteracting with the sun's upperatmosphere as it expands out into the solar system, said one of the researcherswho made the discovery, Jeff Thayer of the University of Colorado in Boulder, during a press conference at the annual meeting of the American Geophysical Unionin San Francisco yesterday. Thisinteraction causes an energy exchange that can change the density of thethermosphere (how closely the gas molecules within it are packed together). Asits density changes, the thermosphere expands and contracts. Extremeultraviolet (UV) radiation from the sun was known to cause a 27-day expansion-and-contractioncycle by changing the thermosphere's density through heating. Thayer andhis team analyzed data from the German Challenging Minisatellite Payload(CHAMP) and the NASA Advanced composition Explorer satellite and found that thethermosphere also appeared to breathe every five, seven and nine days, "whichwas unexpected," Thayer said. Theresearchers determined that the cause of these shorter expansions andcontractions was high-speed winds generated by relatively cool pockets on thesun's surface known as solarcoronal holes, which periodically rotate around the solar surface. Thayer saidthis finding could help improve satellite tracking, which was part of the aimof the study, which was funded in part by the U.S. Air Force. The thermosphereis heavily populated with spacecraft, including the InternationalSpace Station and more than 800 operational satellites. Changes inthe thermosphere's density can change the amount of drag on a satellite,slowing it down when the density is higher. This can throw off estimates ofwhere a satellite's position should be at a given time, which can in turn leadto problems in avoiding collisions among spacecraft and space junk. Thayer andhis colleague hope their discovery will lead to improved satellite tracking. 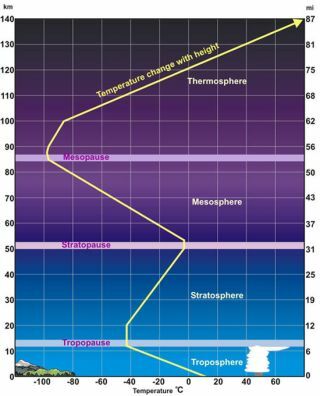 Thisbreathing of the atmosphere can also lead to changes in the composition of the ionosphere,which ranges from the upper portions of the mesosphere (just below thethermosphere) to the exosphere. These changes have implications back on Earth'ssurface, because "the ionosphere affects all kinds of radio operations,"said study team member Geoff Crowley, president and chief scientist at Atmospheric& Space Technology Research Associates (ASTRA) LLC in San Antonio, Texas. The changesin heating that cause the breathing can also impact climate, by triggering theupper atmosphere's "thermostat," as study team member Martin Mlynczakof NASA's Langley Research Center, Hampton, Va., put it. The added UV radiationheats up the atmosphere, in turn causing gaseous molecules to radiate that heataway in the form of infrared radiation.